Pumpkin Praline Waffles from Candleberry was literally swoon worthy!! 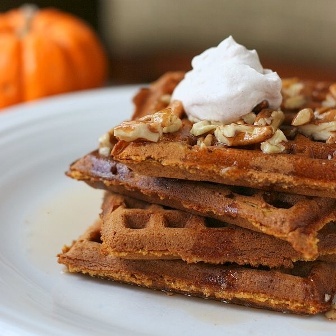 It was very similar to Bath & Body Works Pumpkin Pecan Waffles but this version was a lot more buttery and sweeter. The moment I popped off the lid, I was tempted to eat the wax. It smelled so amazing!! Imagine it is a crisp fall morning and you’ve just gone into the kitchen following the warm rich smells that fill the air. There’s the smell of pumpkin, that rich pie smell but punctuated with the nutty aroma of pecans. Together they make waffles that are waiting for the butter and the syrup and the start of a perfect autumn day. Mmmm!! This candle smelled like warm pancakes, sugared pecans loaded with sweet maple syrup, all wrapped up into one dreamy and moan worthy scent. And boy was it strong. When I’m writing an intro to a review, I always have the candle either sitting next to me or sitting on my desk with the lid off as I type. This specific candle I had sitting on my desk and the aroma was so strong, it actually distracted me. All I could smell was this buttery aroma with sugared pralines – so sweet and delicious. I couldn’t WAIT to light this candle! I decided to take a chance and light this candle in my master bedroom. I was hoping it would be strong enough to scent that size room and boy was it ever. YUM!!! Once the wick was lit, it took a good 2 hours or more to reach a full melt pool but the scent was present long before that and it was deeee-licious!! My entire bedroom was filled with the sweetest scent of pumpkin, sugared pralines and sweet maple syrup. The aroma was strong and very buttery sweet, and every time I walked into my bedroom, I stopped to inhale this aroma in pure appreciation. LOVED!!! Bakery lovers… this one is a must have. Strength – this candle gave a great scent throw. On a scale of 1 to 10, I would rate this candle an 8 in a really large room. 10 in medium to smaller rooms. This candle burned great. No wick issues. Clean burning from start to finish. I did have to stay on top of wick trimming but that’s pretty standard. Pumpkin Praline Waffles was one delectable bakery scent and one I highly recommend to all you bakery lovers out there. Just imagine warm waffles loaded with butter, sugared pecans and maple syrup. Oh yes!! I’ll take five please!! I loved this candle and will definitely be purchasing it again. 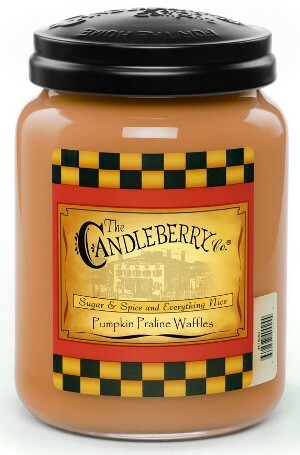 Candleberry has so many great scents I’m looking forward to trying so stay tuned for more reviews to come. All candles sold in the US have lead free wicks. If you see any that aren’t, that will be surprising. I don’t think Candleberry candles are pure soy. I do believe they are paraffin based but a search on their site would answer all your questions I’m sure.